Native Instruments is using the Musikmesse trade show in Frankfurt, Germany to release Guitar Rig Mobile, a new product for guitar players on the go. Guitar Rig Mobile is about the size of a deck of cards and is designed for guitar players on the road. The USB 2.0 hardware unit features 24bit/192 kHz Cirrus Logic audio converters, I/O volume dials, and low-latency drivers for Windows and Mac OS X. 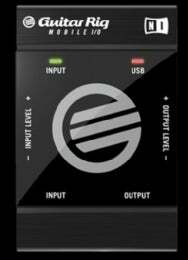 The bundle also comes with Native Instruments’ Guitar Rig LE software, giving users three amps for guitar and bass, 12 effect units and a selection of cabinets. Guitar Rig Mobile costs $119.